and check out my giveaway they are hosting and nominate me for BLOG OF THE MONTH!! I used soft felt and cut out shapes to stick up on the big piece of thicker felt board. When she does all of her tasks and behavior for the day she gets to put one of her shapes on the board. When she gets 7 shapes on the board, she gets $4 since she is 4 years old. And she uses her money to save up for things she wants to have. It has been very effective but she does have many days when there is no reward given :( ~but it keeps her trying harder for the next day. Thought I would share with you. We have now added $1 extra if she memorizes her scripture verse for the week, yep, she is breaking the bank!! One piece of unpainted wood (gotten from Hobby Lobby) it can be any shape, I chose oval. It's pretty simple, I painted the oval and the letter and glued the letter on with super glue and then I hung a piece of ribbon from the back. I picked up a cute little crown from there too, they have so many designs to choose from. Wa La a hairbow holder, I made one for my other daughter as well. Hi Heather - I stopped over from For the Love of Blogs. 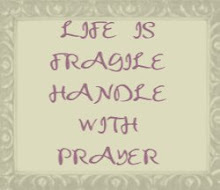 I love the quote you have at the top of your blog, "God can heal a broken heart, but He has to have all the pieces." He can bring complete healing, but we have to give Him it all to Him - completely. Good mooooorning! Hopped on over from the ever so fab For the Love of Blogs and everything looks soooo pretty here! Think I'll stick around! Hope you have a fantabulous day! I was the featured blog yesterday and I'm STILL giddy from it, hope your day is just as perfect! Your ideas were really cute. I'm not a creative person but love to look at other peoples ideas. have a great day. 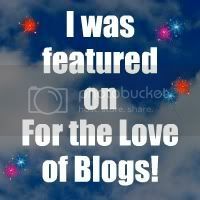 Congrats on being the featured blog on Magical Mondays blog hop! I am a new follower of yours. Please feel free to stop by and follow back when you get a chance.